The positive reaction to Katy’s wildlife work led to a large shift towards oil paints, discovering the rich tones and infinite textural possibilities oils soon became her medium of choice and a huge part of Katy’s development as an artist. Moving to portraiture, Katy worked on a series of iconic women, all eclectic in their abstract colour qualities, heavily embellished and adorned with tactile brush strokes. 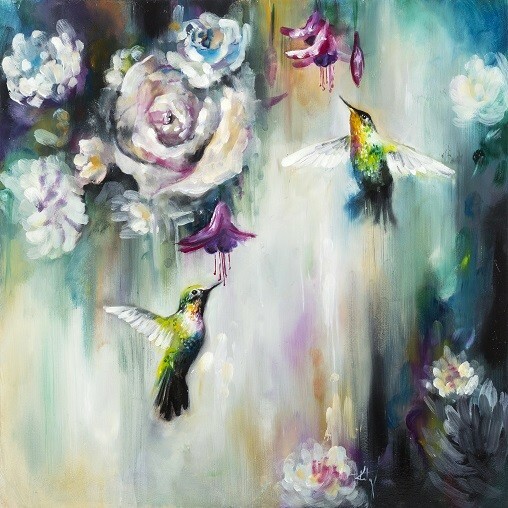 Katys admiration for elegance and richness of pallet moves her to create original oil paintings with a plethora of colour, and a blend of drama, harmony, presence and dissolve.